Clinic of Intensive Treatment of Acute Intoxications and Toxoallergy, Naval Hospital – Varna, Military Medical Academy – Sofia, Bulgaria. The specificity of clinical toxicology has always raised many deontological, medico ethical and legal problems, mainly connected to communication barriers, leading to distortion or total disappearance of the ability of the intoxicated patient to perceive and process the received information about his state and necessity of treatment, to agree or refuse medical help, to permit announcing data about his case. During the decade 2000-2010 significant changes in Health law, minor decrees and Medical Ethic Codes have been done, solving partially some of these questions. The new conceptions and conditions aroused new problems, connected with the intoxicated patient’s autonomy, right to information, confidentiality, etc. The necessity of some adaptation of the official formulary of informed consent for clinical toxicology is discussed with accent on the dynamics of the process rather than on one-moment decision. A requirement of informed refusal by a whole sentence, free text, hand written by the patient, instead of simple signature is recommended. Current analysis and discussions of the deontological questions of toxicology are important. Key words: deontology, clinical toxicology, communication, consciоusness, competent, information, autonomy, duress, access, law. Please cite this article as: Yovcheva M. Deontological Problems of Clinical Toxicology in Bulgaria, Connected to Communication Difficulties, during the Decade 2000-2010. J of IMAB. 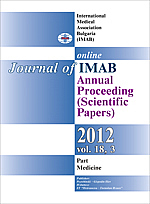 2012; 18(3):308-311. doi: 10.5272/jimab.2012183.308.